Adam de Guirande has barely survived the aftermath of Roger Mortimerís rebellion in 1321. When Mortimer manages to escape the Tower and flee to France, anyone who has ever served Mortimer becomes a potential traitor – at least in the eyes of King Edward II and his royal chancellor, Hugh Despenser. Adam must conduct a careful balancing act to keep himself and his family alive. Fortunately, he has two formidable allies: Queen Isabella and his wife, Kit. England late in 1323 is a place afflicted by fear. Now that the kingís greatest traitor, Roger Mortimer, has managed to evade royal justice, the king and his beloved Despenser see dissidents and rebels everywhere ñ among Mortimerís former men, but also in the queen, Isabella of France. Their suspicions are not unfounded. Tired of being relegated to the background by the kingís grasping favourite, Isabella has decided it is time to act – to safeguard her own position, but also that of her son, Edward of Windsor. As Adam de Guirande has pledged himself to Prince Edward he is automatically drawn into the queenís plans – whether he likes it or not. Yet again, Kit and Adam are forced to take part in a complicated game of intrigue and politics. Yet again, they risk their lives – and that of those they hold dear – as the king and Mortimer face off. Once again, England is plunged into war ñ and this time it will not end until either Despenser or Mortimer is dead. 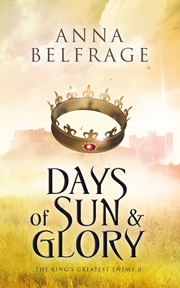 Days of Sun and Glory is the second in Anna Belfrageís series, The Kingís Greatest Enemy, the story of a man torn apart by his loyalties to his lord, his king, and his wife. It was great to see that Adam and Kit have managed to get such a happy marriage despite the way it started. It’s not all happy times but they’re still there for each other and I love their relationship. I wasn’t a fan of Mortimer in book 1 and I’m still not but I was waiting to see how Adam would feel about the future and Mortimer’s role in it. It seems Adam has chosen prince Edward’s side and I’m glad about that. I wonder how that will go in the future. I was so glad that Joan didn’t just forgive her husband all the misery he had cost her. I’ve always wondered what she thought about all that Mortimer was doing and his affair with the queen. I liked the future Edward III and I hope we’ll see much more about him in the next book. I felt bad for Hugh Despenser but then again I have a soft spot for him. This isn’t my view of him in the book but it worked here. Another great book by Anna Belfrage and this was even better than the previous book. I just wanted to keep reading! I really loved this and I can’t wait for the next book. Had Anna been allowed to choose, sheíd have become a professional time-traveller. As such a profession does as yet not exists, she settled for second best and became a financial professional with two absorbing interests, namely history and writing. 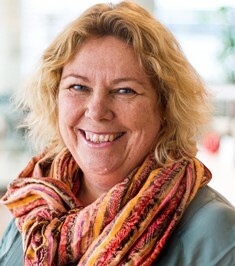 These days, Anna combines an exciting day-job with a large family and her writing endeavours. When Anna fell in love with her future husband, she got Scotland as an extra, not because her husband is Scottish or has a predilection for kilts, but because his family fled Scotland due to religious persecution in the 17th century ñ and were related to the Stuarts. For a history buff like Anna, these little details made Future Husband all the more desirable, and sparked a permanent interest in the Scottish Covenanters, which is how Matthew Graham, protagonist of the acclaimed The Graham Saga, began to take shape. Set in 17th century Scotland and Virginia/Maryland, the series tells the story of Matthew and Alex, two people who should never have met ñ not when she was born three hundred years after him. With this heady blend of romance, adventure, high drama and historical accuracy, Anna hopes to entertain and captivate, and is more than thrilled when readers tell her just how much they love her books and her characters. Presently, Anna is hard at work with her next project, a series set in the 1320s featuring Adam de Guirande, his wife Kit, and their adventures and misfortunes in connection with Roger Mortimerís rise to power. The Kingís Greatest Enemy is a series where passion and drama play out against a complex political situation, where todayís traitor may be tomorrowís hero, and the Wheel of Life never stops rolling. The first installment in the Adam and Kit story, In the Shadow of the Storm, was published in 2015. The second book, Days of Sun and Glory, will be published in July 2016. Other than on her website, www.annabelfrage.com, Anna can mostly be found on her blog, http://annabelfrage.wordpress.com ñ unless, of course, she is submerged in writing her next novel. You can also connect with Anna on Facebook, Twitter and Goodreads. Guest Post at Oh, for the Hook of a Book! That’s a good point :) I like Edward so it’s always a good thing to have him in a book. Difficult not to like Edward, isn’t it?